The advantages of rainwater tanks to meet domestic demand are obvious, as mirrored by the international trend towards including rainwater tanks in water conservation strategies. It is therefore surprising that there are relatively few locations in South Africa where rainwater tanks have been systematically incorporated into new housing developments. The resistance to their wider adoption may be due to a lack of clear and simple guidelines of how they should be sized, and their associated risk of failure. The paper will briefly review the available methods for rational tank sizing and then propose a simplified framework for local application. The proposed procedure will be demonstrated by a design example for three selected locations in South Africa. The models previously proposed in the literature rely on three different approaches. Both the demand side approach (Centre for Science and Environment) and the supply side approach (Rees & Ahmed 2002) require information on the rainfall pattern, which can be obtained from historical data. The demand side approach starts with the daily water requirement, and sizes the tank according to the longest consecutive number of days without rain, whereas the supply side approach is based on the premise that all the available water running from the roof should be harvested. The latter therefore isolates the wet season from the remainder of the year, and then suggests a tank size to contain all the runoff during the wet season. Both these methods have obvious weaknesses. The demand side approach assumes that the roof is large enough to fill the tank prior to the dry season, therefore possibly leading to a less reliable supply. The supply side approach only considers the available water, even if it is much more than the demand, therefore possibly leading to an overly large and expensive storage tank. A variation on the demand side approach for sizing rainwater tanks has been developed in the United Kingdom (Fewkes & Warm 2000). The method requires the calculation of an input ratio, which is defined as A*(MAP)/D, where A is the catchment area, MAP is the mean annual precipitation and D is the average annual demand. 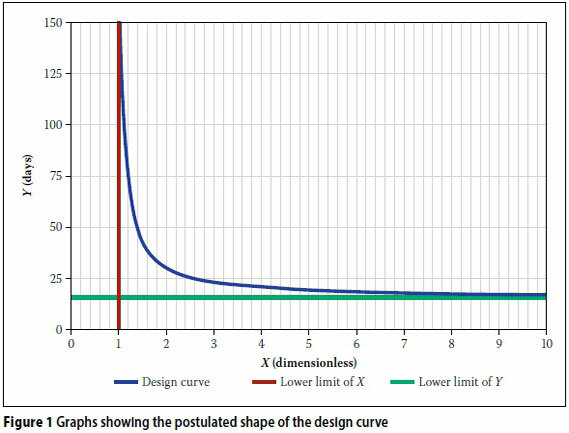 This ratio is then used along with a desired performance level to determine the number of days' storage that ought to be provided by means of a set of design curves. 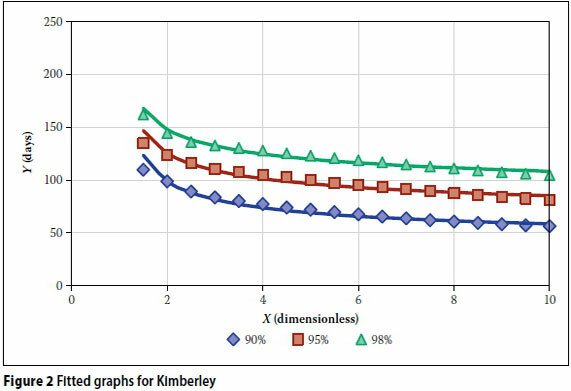 Each design curve shows the storage period versus the volumetric reliability for a specific value of the input ratio. The justification for using only one curve for a given input ratio comes from the fact that very little difference exists in the United Kingdom from one location to another (Fewkes & Warm 2000). The runoff coefficient is a function of the roof surface and gutter integrity, and is usually taken as close to 1 for impervious roof materials. The system filter efficiency is determined by the presence and nature of a filtering device included for water quality purposes before the storage tank. If D < MAP, MAP would be replaced by the annual demand (D). The mathematical simulation of the tank level provides a third approach which eliminates the main weaknesses of the other two approaches, but it requires a detailed rainfall record covering at least ten years, preferably longer. It furthermore requires more computational effort, which is only possible with computer simulation. A number of computer models which are capable of doing such a simulation are available. These include the Model for Urban Stormwater Improvement Conceptualisation (MUSIC), Aquacycle and Raincycle (Ward et al 2010). The mathematical simulation approach, however, has the additional power of coupling the reliability of supply with the tank size, which is a prerequisite when considering rainwater tanks for domestic water supply. ■ The rate at which water is withdrawn from the tank, expressed as a constant daily withdrawal, or annual average daily demand (AADD) in ℓ/d. Where water is used for indoor demand and the number of inhabitants stay the same, the assumption of constant demand is reasonable. ■ The supply security (S), expressed as the fraction of the total water demand met by the tank. If secondary or emergency supplies with tankers, for example, are available, the supply security could typically be around say 90%. In the absence of secondary supplies, the required supply security should be higher, say around 98%. ■ The roof plan area (aerial view) from which the water is harvested, expressed in m2. ■ The tank volume (V), expressed in ℓ. ■ The mean annual precipitation (MAP), expressed conventionally in mm/year. If the runoff parameter X would be 1, the total water harvested from a roof in an average year would be just enough to provide the total annual water demand. This provides the theoretical lower limit of X. To account for the fact that (a) the annual rainfall is variable from year to year, and (b) that the rainfall is unevenly distributed within any year, X has to be in excess of 1. The storage parameter Y, in practical terms, simply provides the number of days of average demand that can be supplied from a full tank, provided no water flows into the tank. Y also has a lower limit determined by the length of the longest dry spell during the year, which corresponds to the volume predicted by the demand side approach reviewed earlier. The idea of simplifying the process in this way is not altogether a new one. As mentioned above, Fewkes and Warm (2000) used a simplifying parameter A*MAP/D, which is equal to the runoff parameter X, suggested above. Ghisi (2010) developed a ratio F, which is the inverse of the runoff parameter. It is intuitive that there should be an inverse relationship between X and Y - a larger, more continuous supply of water from the roof will obviously require less storage. In addition, for both X and Y, asymptotic limits exist. As the runoff parameter X approaches 1, the required tank size, and thus the storage parameter Y, will approach infinity, as no water may be lost by spillage. On the other hand, as the storage parameter Y approaches its lower limit, the runoff parameter X will approach infinity, as the tank has to be completely filled by even the very small rainfall events, thus requiring a very large roof surface. From the above the general relationship follows, as shown in Figure 1. The difference between the water supply reliability calculated by the two methods is typically approximately 0.3%. However, when small tank sizes are investigated, spillage will occur more often and the difference in reliability obtained from the two methods may be as high as 3%. 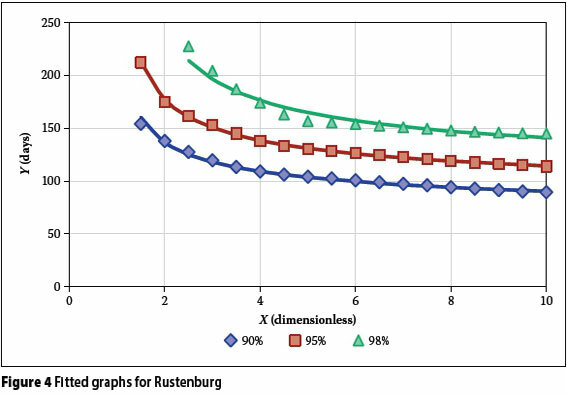 The structure of the proposed equation was tested by simulating the behaviour of a rainwater tank at three stations (Kimberley, Mossel Bay and Rustenburg). The stations were selected to include both seasonal and year-round rainfall regions, as well as differences in mean annual precipitation. The simulations were conducted using daily rainfall data over a 16-year period (1994-2009), obtained from the South African Weather Services. The validity of the equation was tested at S = 90%, S = 95°% and S = 98%, using the method for simulating a rainwater tank, as described above. 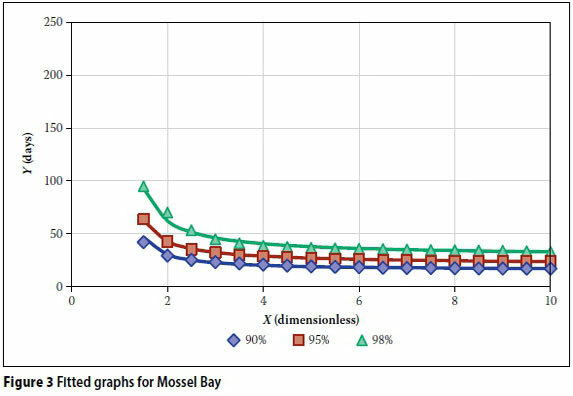 Each simulation was done using both the yield-after-spill and the yield-before-spill approaches, and their average value was then used for model calibration. The parameters a and b were determined with least-square fitting of the simulated data points. Figures 2, 3 and 4 show the resulting graphs for the three stations in solid lines, as fitted to the data set shown with markers. The coefficient of determination for each of the fitted graphs to its corresponding data set was also calculated. Table 1 provides a measure of the goodness-of-fit of the proposed equation. All the results show coefficients of determination of more than 94%, which is considered to be adequate for design purposes, given the inherent variability and deficiencies of the available hydrological records. Figures 2 to 4 also show a relatively sharp inflection point at a storage parameter of about X = 2, which means that the equation should be restricted to values of X > 2. 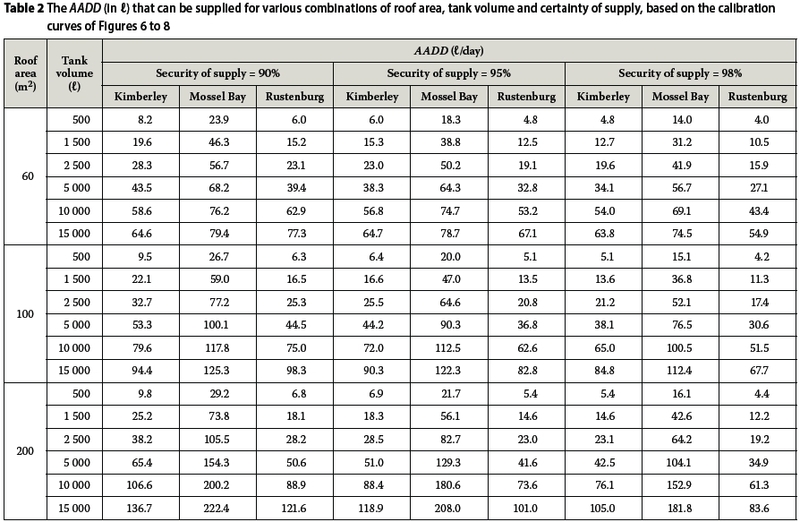 Table 2 shows the results for the total AADD that can be supplied by a tank for various combinations of roof area, tank volume, certainty of supply and location. The results were obtained by using the equations determined by using the simplifications discussed above. The roof area and tank volume were substituted into the relevant equation for the location and certainty of supply, and a solver was then used to determine the maximum AADD that could be obtained from the tank. The results show clearly that there is no correlation between the MAP and the AADD that can be supplied. The MAP for Mossel Bay (532 mm) and the MAP for Rustenburg (579 mm) are much closer to each other than the MAP for Kimberley (428 mm). 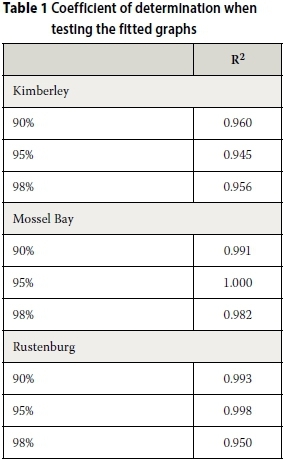 However, the AADD which can be supplied at Rustenburg is much closer to the results obtained for Kimberley than those obtained for Mossel Bay. The sizing of rainwater tanks is therefore more dependent on the seasonal variability of the rainfall than on the MAP. The only way to take this into account for a large region like South Africa, with its significant differences in rainfall characteristics, is to work from first hydrological principles as done in this paper. The results also show clear links between the AADD that can be supplied, the roof area and the tank volume. As expected, the AADD will increase as the roof area increases, but the increase is significantly larger when a larger tank is used. This is due to the fact that increasing the roof area will have no effect if the tank is not large enough to store the increased volume of runoff. The effect of a larger roof area, however, is smaller when the certainty of supply is increased. Increasing the tank volume will also create an increase in the AADD that can be supplied. Similar to an increase in roof area, the increase in AADD is larger when the tank volume is larger. The equations that are obtained by using the simplifications discussed above thus account adequately for changes in roof area, tank volume, certainty of supply and location. Consider a typical low-cost housing development with the roof areas of individual homes being 65 m2. Estimate the constant daily demand that can be harvested if every home is supplied with a storage tank of 3 000 ℓ. The calculations are shown in tabular form in Table 3. ■ The results of the study show that an equation of the form Y = a(X-1)b + c can be fitted to simulated data for rainwater tanks with a minimum coefficient of determination of 0.94. Rainwater tank sizing can therefore be performed with good precision in terms of a storage parameter Y and runoff parameter X. ■ The determination of the constants a, b and c requires a long, reliable record of daily rainfall records. The analysis presented for three randomly selected sites in South Africa needs to be extended to more South African sites before general expressions for the constants may be determined. ■ The amount of annual rainfall seems to be less critical for rainwater tank sizing than its seasonal variation, which further underlines the need for analysis at different sites. ■ The design examples for the three reported sites indicate that rainwater tank harvesting could go a long way in providing the domestic demand of developing communities, and therefore deserves closer scrutiny by water supply engineers. The current study assumed that 100% of the rain which falls on a roof is available for collection. However, in reality this is not the case. Losses are created by the uneven texture of the roof, the guttering system used, as well as possible evaporation losses. The study also did not consider the effect of a water treatment system, such as a first flush system, which will also create losses in the system. Further research should be done to refine the suggested equation when these losses are considered. JACQUI ALLEN obtained a degree in Civil Engineering from the University of Johannesburg in 2008 and a Master's in Civil Engineering from the same university in 2012. Her research focused on tank sizing for roof top rainwater harvesting. She is currently working as a civil engineer for SMEC South Africa. DR JOHANNES HAARHOFF graduated as a civil and environmental engineer at the University of Stellenbosch, South Africa, and Iowa State University, USA. He spent the first part of his career in municipal employ, civil construction, and design and project management, before joining the University of Johannesburg in 1990, where he led the Water Research Group. This group focuses on both applied and fundamental aspects of drinking water treatment and supply.